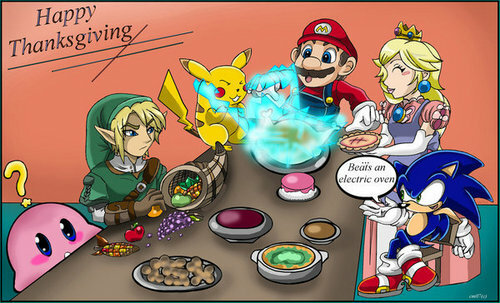 Brawl Thanksgiving. I know it not thanksgiving, but this picture is cool :). Wallpaper and background images in the Super Smash Bros. Brawl club tagged: super smash bros. brawl link mario peach kirby pikachu sonic thanksgiving. LOL That's a good way to cook the turkey! I'm inviting Pikachu for thanksgiving! Sonic : Beats an electric oven! Kirby : What the f*ck is he doin'? I love Link and Kirby's face of "WTF?" Sonic is the only one who looks like he was given a real sprite (maybe link too). Well, who cares! Fan art is better. This is funny! Wait, couldn't Mario just use fire ball or Mario finalë?